Christopher Riddle’s book, DISABILITY AND JUSTICE, addresses the perplexing problem of the absence of people with disabilities from the scope of justice as most people perceive it. The book begins with Riddle expressing his concern that traditional views of justice do not adequately account for the conditions and needs of people with disabilities. In other words, in his view, justice as perceived by most people does not encompass issues of concern to people with disabilities because the disability population is outside the parameters of their vision of egalitarian justice. Riddle attributes this largely to the fact that people without disabilities lack understanding of the injustices imposed on people with disabilities and therefore omit them from their theorizing. He hastens to add that he is not saying that one must be disabled to theorize about egalitarian justice that includes people with disabilities, but merely that people without disabilities are unfamiliar with issues affecting people with disabilities and therefore do not find them pressing. Riddle cites approaches to justice theories offered by John Rawls and Robert Nozick as prime examples of inadequate theorizing about people with disabilities within the realm of justice. He argues that his analysis remedies the deficiencies of mainstream justice theorists by proffering a revised version of the “capabilities approach” to justice, largely identified with philosopher Martha Nussbam and economist-philosopher Amartya Sen. Riddle’s solution is to assert the primacy, that is, the moral importance, of health, in assessing the well-being of people with disabilities. Without sufficient considerations for his or her health, Riddle claims the individual is still disadvantaged despite access to the remaining capabilities. After peeling away the levels of analysis, ultimately, the book represents his reason for finding the “capabilities approach” lacking and his justification for amending it. Before delineating the “capabilities approach,” Riddle first offers definitions of disability and, in doing so, he explains the differences among three competing models of disability – social, medical, and interactional. He prefers the latter because, in his view, it offers the best understanding of disability with its flexible stance on the relationship between impairments and disabilities. Although I believe he correctly identifies the interactional model as the most useful, it would have been helpful if Riddle had situated these models within a historical context and offered more details about how they differed from each other – both in theory and in practice. 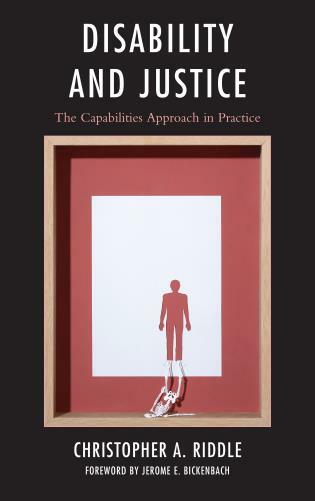 The heart of the book is devoted to a detailed explanation and engagement with Nussbaum’s “capabilities approach” as the key to understanding what, according to Nussbaum, “it means to be truly human” (p.32). The origins of the “capabilities approach” are in the writings of Amartya Sen, who stressed that people with disabilities require a higher level of resources than people without disabilities to be able to function in the environment. Riddle moves from Sen to Nussbaum and focuses on her “capabilities approach” because, unlike most others, she explicitly employs it as a vehicle to seek justice for people with disabilities. Nussbaum compiled a list of ten basic capabilities that are required for individuals to have human dignity. Although this review is not intended to evaluate Nussbaum’s work, it is necessary to briefly list these capabilities in order to understand Riddle’s amendment to her conception of the basic needs of humans. They are: “life,” “bodily health,” “bodily integrity,” “senses, imagination, and thought,” “emotions,” “practical reason,” “affiliation,” “other species,” “play,” and “control over one’s environment.” Nussbaum views all these as essential and argues that a deficiency in one element cannot be compensated for with a surfeit in others. It is important to note that Riddle does not object to the inclusion of any of these; indeed, he seems to approve of them and clearly admires Nussbaum’s approach to justice for people with disabilities. He considers her theory somewhat flawed, however, because it does not rank order or prioritize among the list of human capabilities. In his view, the primary problem with her approach is that it is not sufficiently concerned with minimizing the stigmatization of people with disabilities; his basic premise is that the conception of capabilities must be stigma-sensitive. Thus, his major critique of her “capabilities approach” is that it does not recognize that health is distinctive because it “plays a special role in the promotion of well-being within the capabilities approach” (p.77). Riddle arrives at his conclusion of the importance of the health capability by assessing the extent of the disadvantages to the individual that result from its absence. He bolsters his thesis with the very reasonable assertion that the absence of health leads to a special kind of disadvantage, that is, that it has a more “corrosive” (p.81) effect on the individual’s ability to pursue his or her well-being than a deficit of any of the other capabilities. Riddle brings a tremendous amount of knowledge to the subject of justice and egalitarianism for people with disabilities, as is evident in his discussion of the justice and disability literature. And he offers a well-reasoned argument for his revision of Nussbaum’s analysis, especially his emphasis on avoiding stigmatization of people with disabilities. One difficulty that may arise for some readers is that there are too many instances when the book relies on an overuse of jargon. Simply put, the analysis is likely to be somewhat inaccessible to non-philosophers at times, especially those who are unfamiliar with the disability rights literature and may be new to the effort to link disability to principles of egalitarian justice. One manifestation of this problem is that Riddle tends to assume that his readers are familiar with the numerous theorists andphilosophers to whom he refers and therefore he typically provides only a cursory analysis of their arguments. Without a more elaborate underpinning of the principles upon which he draws in formulating his theory, the reader has little or no context in which to evaluate his critiques of other theorists. Another issue of concern for the reader is that although Riddle does a fine job of making his case for a revised “capabilities approach,” in doing so, he omits consideration of how his approach would have a practical effect on the lives of people with disabilities in contrast, for example, to the Nussbaum approach or the Sen approach (or indeed any of the other theorists he cites in his analysis). His stated goal is to maximize opportunities for people with disabilities; he would more effectively achieve that goal, in my view, by devoting more attention to explaining how his theory accomplishes this. Copyright 2014 by the Author, Susan Gluck Mezey.